Our group has been playing Pathfinder consistently for about two years. In that time I've changed the way I DM quite a bit. Our long running 4th edition D&D campaign was built with meticulous notes and hand drawn maps, custom rule sets and even home recorded sound/dialog. When we shifted solidly to Pathfinder, the calculations and necessary notes became vast and unwieldy. Around this time I switched to using Excel sheets and PDF's of the books for our games. My pile of papers and bookmarked core books were consolidated and replaced by my laptop. Still, switching to different PDF's and spreadsheets was damn near impossible to do quickly. A simple ruling on a condition or spell effect became an ordeal. Tracking damage and initiative was wonky and often prone to mistakes. I've looked into programs like Hero Lab before, but the ridiculous expense that comes along with it left me feeling a touch exploited. And even with the regular updates from Paizo, there were still features that I found to be wholly lacking. About a month ago, I came across something while browsing the scholarly r/pathfinder. A few people had posted about their experiences with Combat Manager. From their posts I gathered that it was extensive, intuitive, customize-able and free. Convinced that this was too good to be true, I followed the first link provided in the comments and downloaded it for myself. I am happy to report that Combat Manager is everything it was touted to be and more. This program has made our game so much easier to play and manage. When first exploring the interface, I thought that as well laid out as the combat screen was, it was a shame I couldn't track conditions like fatigue or poison. Then I found the condition tracker and discovered that not only could I assign conditions to any PC or NPC, but it would also track how many rounds it remained in effect. My next wish was for a rules reference. Again, I found it even more complete that I had hoped for the rules reference is searchable and capable of setting bookmarks for quick reference. The overall program is a godsend for any new or experienced DM. 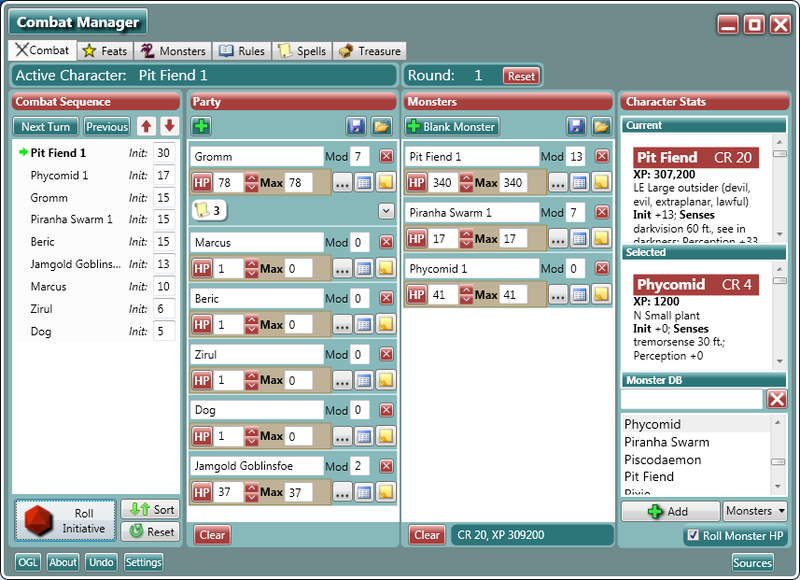 Combat manager is constantly evolving to include new info and more complete tools. What I thought would be a decent way to track initiative has become my favorite game tool, taking the place of spreadsheets, lengthy notes and stacks of books. Now I'm just waiting for an android compatible version.